Ancient Greek Mythology tells us of a wondrous and powerful creature possessing the strength of the lion and the vision and wisdom of the eagle. 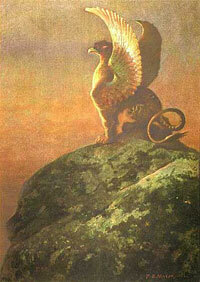 The Gryphon it had been thought, had a sixth sense, the ability to know where to look for gold. Because of this great ability to discover and protect treasure, it was selected by Zeus to guard the Gold of the North. Steadfast and loyal, the Gryphon provided much comfort to his master. As the years provided times of feast and periods of famine, the treasure of Zeus remained safe and secure under the watchful eye of Gryphon. Because of its noble qualities, the Gryphon came to symbolize both strength and wisdom combined in heraldry. Today, the Gryphon is revered as a symbol of nobility and a trustworthy guardian of wealth. Gryphon Valuation Consultants, Inc. services to embody the spirit of our namesake. We take great pride in defining and defending value. We have a unique ability — call it a sixth sense — to discover and create value from within.